Recently, we informed you here that we were striving to obtain the so-called NHG surgery accreditation. 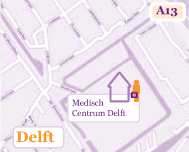 We are please to inform you that we have been awarded this quality mark of the Dutch Society of General Practitioners. A representative of this independent scientific association of GP's in the Netherlands performed a thorough screening of our surgery, whereupon he established that GP surgery Hartel delivers excellent and reliable care. From now on, the practice will be screened annually, to ascertain that we still meet the requirements and that we keep applying improvements.